Enthusiasm spreads from Carol Wilcox-Jones to everyone she meets. It’s contagious! Carol is the spark that gets things going, whether at her summer music camps or at the Salt Fork Festival. She does it all with a song in her heart. Growing up in Kansas, the Wilcox family sang even while doing housework. “I can’t remember a time when I didn’t sing,” Carol recalls with a sparkle in her eyes. Her dad played guitar at square dances and sang on the radio, while her mom did the Charleston and even clogged. Family always ranked high in importance to Carol. At age five, she sang “Rudolph the Red-Nosed Reindeer” with her dad at a square dance. Even though Carol sang with her dad on stage at the age of five, it was in high school that the singing bug really bit her. She sang the leading role of Laurie in Oklahoma, followed by many more leading roles. By the time she was a senior, she was invited to enter the Miss Kansas City pageant, which she won singing “Love Is Where You Find It” and “Clap Your Hands”. While studying at the University of Kansas she performed leading roles such as Maria in West Side Story, and Marion in The Music Man. She heard her first opera there when the Metropolitan Opera Touring Company came to perform. Carol smiled, “I fell in love with their thrilling singing.” Shortly thereafter, she had a chance to perform as the Countess in The Marriage of Figaro, still her favorite Mozart opera. Carol performed as Aurelia in the opera, Captain Jinks of the Horse Marines. During college summers, Carol apprenticed herself at Central City, Co. and Santa Fe Opera companies. Upon graduation, she decided she would try a career in the opera and where better to do that than The Big Apple. While working toward her master’s degree at the Manhattan School of Music, she was invited to audition for the Metropolitan Opera. She was offered an artist contract and was soon busy learning new operatic roles. In the comic opera, Barber of Seville, Carol appeared as Rosina. Her list of performances is quite extensive and can’t possibly be listed here. In addition to her roles with the Metropolitan Opera in NYC, she has sung leading roles throughout the US and Canada, including the Washington Opera at Kennedy Center, Philadelphia, Miami, Houston Grand Opera, New Orleans, Pittsburgh, and many others. Carol sang in Perichole at the Kansas City Lyric Opera. She has performed and enjoyed music theatre roles with St. Louis MUNY Theatre, KC Starlight, Blossom Festival, Caramoor Festival, and others. Carol has appeared on Broadway, sung over 100 recitals, and recorded for RCA and CRI, and has been a featured soloist with many symphonies. Carol and her family’s dalmatians appeared on the cover of Star in 1975 when she appeared at the Lyric Opera in Kansas City. One summer, when Carol was performing at the Lyric Opera Co. in Kansas City, there was also a young man, Robert Jones, under contract. Robert spotted the lovely lady with the beautiful voice and became her biggest fan. A year later, they were married. Robert Owen Jones and Carol Wilcox-Jones perform here in “Die Fledermaus”, an operetta by Johann Strass II. Robert was that old-fashioned guy she admired, and family had always been important to her. After their marriage and the birth of their son, Chris, they moved to New Concord where Robert taught music as Director of Vocal Activities at Muskingum College. The couple also happily welcomed their second child, Jennie, to their family. Carol, Bob, Jennie and Chris enjoy singing together as The Jones Family. The High School Summer Music Theatre CAMP at Muskingum University has been directed by Carol since 2006. Carol’s musical background contains many degrees, extensive performing and teaching experience, but it’s her application of all this knowledge that makes Carol such a valuable asset to the groups she works with. Robert and Carol had been fans of the Salt Fork Arts & Crafts Festival for years. When Robert retired, he volunteered to schedule the musical portion of the Festival, and it followed that Carol assisted him before she became also involved with fundraising. Last year, Carol became Director of the Festival. Even though she didn’t feel experienced, the festival turned out to be wonderful and was indeed a happy place to spend the weekend for both artists and visitors. Carol received the Distinguished Service Award for her role in reviving the Salt Fork Arts & Crafts Festival. Her role in reviving the Salt Fork Arts & Crafts Festival earned her the Distinguished Public Service Award. Her time and energy devoted to this project have been phenomenal. Connections with various groups and businesses in the community have made it possible to continue financing this popular three-day event. Robert and Carol entertained at the Salt Fork BASH, accompanied by Preservation Dixieland All-Star Band. One special event, the Festival BASH, became their signature fundraiser. The support of the community has been outstanding, seen through the participation and success of the BASH, which is an evening filled with visiting friends, delicious food, outstanding music, and many prizes and silent auctions. Carol works with a great group of volunteers as they prepare for the 50th Anniversary. The next big project is working with a 50th Anniversary Blue Ribbon Committee for the 2019 festival. There are plans to begin building an enhanced entranceway to the park at Edgeworth Street that will be a permanent feature and reminder of the festival for future generations. This foggy view from our hotel room featured the new Metro Rail. Last week I had the opportunity to participate in the 2018 Heartland Travel Showcase to let others know about attractions and events in the Cambridge, Ohio area, and especially tell them about Dickens Victorian Village. It’s always a pleasure to tell others about your hometown. Buffalo, New York hosted the 2018 Heartland Travel Showcase. Arriving by coach with several other travel associates, we were greeted by a fog covered Buffalo due to warm temperatures and a still frozen Lake Erie. The lobby of the luxurious Hyatt Regency Hotel welcomed us. After getting settled into the Hyatt Regency Hotel in downtown Buffalo, it was time to have dinner with fellow travelers. These travel showcases are the perfect place to make new connections for future tours. Barb, January and Carol enjoyed meeting friends at one of the receptions. Heartland is where booking group travel is a Heart-to-Heart business. Numerous occasions provide a chance to network with others. It’s also the place where you can create a more personal relationship with possible clients during receptions and meetings. A couple chocolate samples still untouched. The Goo Goo Cluster was created and distributed by the Grand Ole Opry. Treats were non-stop from the time we stepped on the charter coach, where a box of chocolates were passed around. The Chocolate Tasting continued day after day with many chocolate treats being given in the form of candy or desserts. Exhibitor booths were placed in nine long aisles for ease of locating. Contacts, leads, ideas and bookings are what Heartland is all about. With over two hundred exhibitors and sixty tour operators at the Buffalo Niagara Convention Center, it’s a great chance to learn more about the travel industry as you meet new people and learn about their wants and needs. President Theodore Roosevelt told us about some of his accomplishments. Buffalo served as his Inauguration site after the assassination of Pres. McKinley. An exciting forum gave newcomers a chance to learn from more experienced faces in the tour industry. Technology has changed the face of the industry as more publicity is being done via social media. They stressed the importance of promoting posts as well as using keywords to help people connect. Cambridge tourism partners, Bev and Dixie, explain local attractions to a tour company. Much of the three day session was spent one-on-one with tour directors meeting exhibitors and learning more about their places to visit. What a difficult job they would have in deciding as each place sounded like the perfect place for a group tour. Exhibitors Mary, Mary and Chris sparkled during an evening reception at the Lafayette Brewery. You could schedule up to forty meetings with various group leaders. The rest of the time was spent either visiting other people’s booths or talking to people who stopped by your booth. Communication about travel was the name of the game. Three days later, the coach was loaded for the return trip home. The event definitely spread the word about an event or destination. Most attending say it is their favorite travel show of the year. It is one of the friendliest places you can imagine. This painting of the skyline of Buffalo hung in the walkway to the Convention Center. Shuffle off to Buffalo or your favorite travel destination sometime soon. New places await your exploration. Use your Sixth Sense! 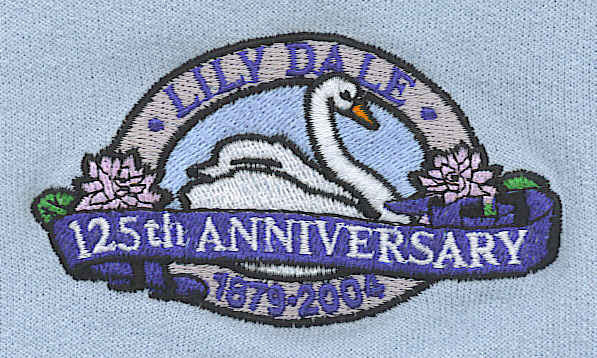 Transforming the inner self to use that sixth sense of intuition and spiritual awareness is the main goal of Lily Dale Assembly,which has been around for a long, long time. Established during 1879 in Chautauqua County, New York, this small village has been the world’s largest center for spiritual development through Spirtualism religion. A Spiritualist is a person who believes that life continues after death and individuals are responsible for their own behavior. Many Spiritualists are also Mediums or Healers, but not all. They are busy searching for the truth. A feeling of peace is prevalent throughout Lily Dale. During the summer there is a varied program of world renowned speakers. Over the years, this has included such names as Neal Rzepkowski, John White, Deepak Chopra and Wayne Dyer. Mediums, teachers, and healers frequent the place on a year round basis with a permanent population of nearly 275. Set on the eastern shores of Cassadaga Lake, the energy of the spiritual world can be felt in this serene setting. 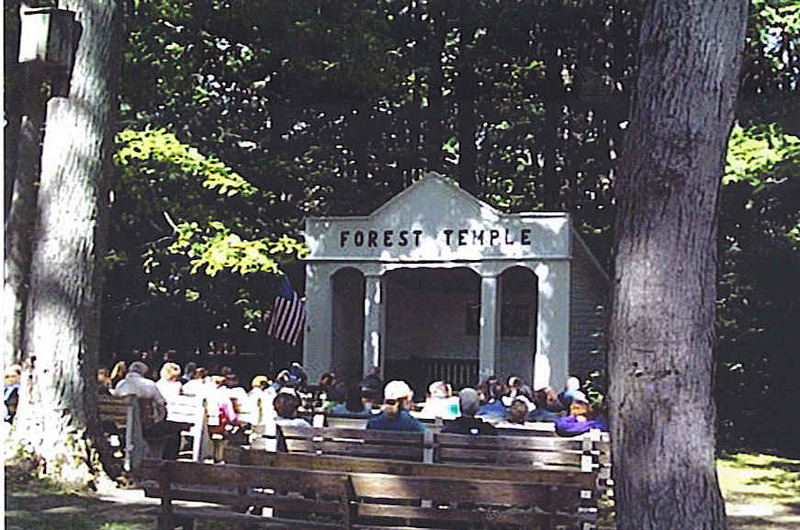 As you travel the paths deep in the woods, you will find Forest Temple where communication services are held at the end of each religious meeting to receive spiritual messages. Here many people feel they receive messages from loved ones who have gone on before. 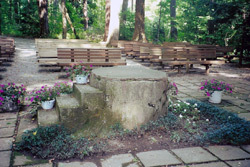 At the end of the forest trail is Inspiration Stump, a sacred spot. Visitors often say they feel a profound sense of peace and heightened sense of awareness when sitting here. This is the site of the most intense spiritual feeling at Lily Dale. Since 1898, two services are held here each day where mediums receive messages from Spirit to members of the audience. A purification ceremony in the Indian sweat lodge is performed several times during the year. 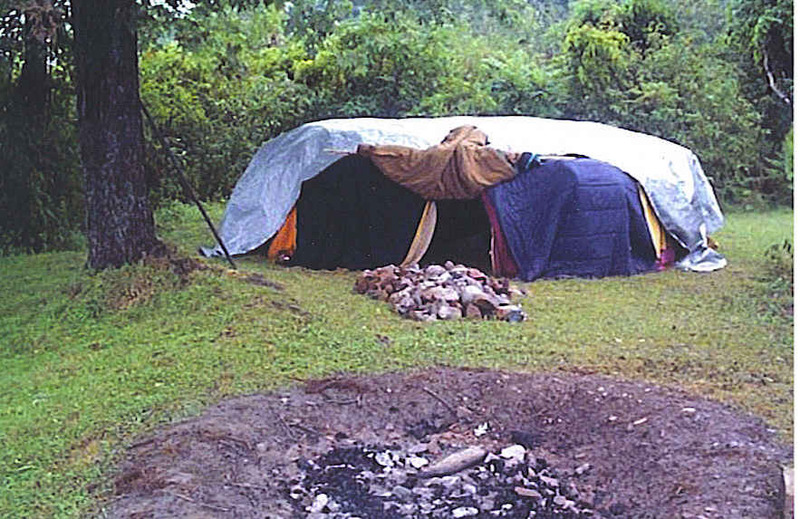 Approximately ten feet in diameter, the sweat lodge is covered with a heavy tarp to keep the heat of the stones inside. In early times, the Indians would have used animal skins for a covering over the bent birch branch framework. While crawling through the door, participants are smudged with smoke from sweet grass, sage or cedar as initial cleansing. Inside everyone, dressed in loose, comfortable clothing, sits on the floor cross-legged in an attitude of peace. Staying in Lily Dale is half the experience. Everyone congregates on the front porch in the evening to exchange stories and experiences. 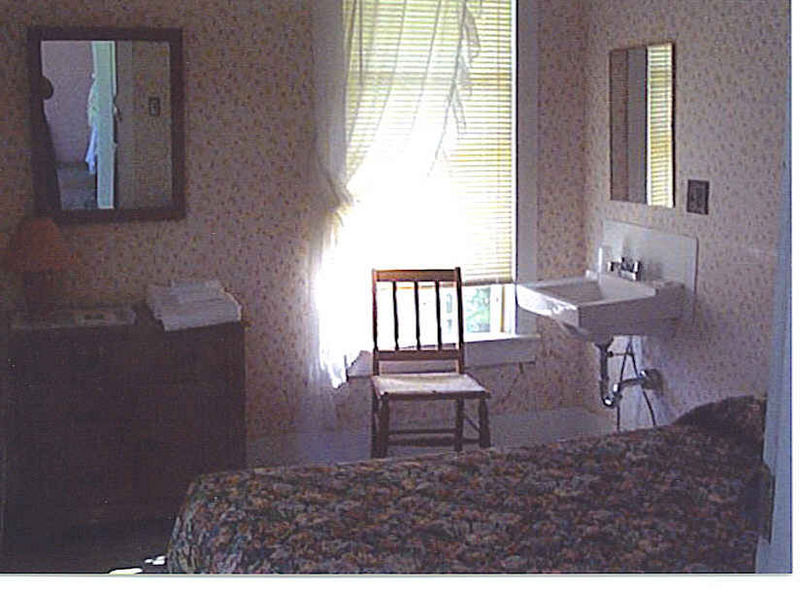 No connection to the outside world is encouraged so there is a complete lack of television, radio, or phone service in the rooming houses. Rooms are sparsely, but comfortably, furnished with shared bath facilities in most places.